We here at the OCNA blog first noticed on December 30th, 2014, that if you typed www.travelfleas.com into your web browser of choice, that you were redirected to www.geofleaz.com. There we found a new website, with a new name and a new design; all for the same great product, of course. The change was announced on social media (and even via email if you were an existing customer) a couple days later, and we asked Mike and Karen from GeoFleaz™ if we could do a blog post. We agreed that rather than a long drawn-out interview on the re-branding of their product, that we could just copy and paste some of the information on who they are, why they started the business in the first place, and why they changed their name, from a couple different places on their website, and repost it here. After all, we’re both busy! Winner announced for the TravelFleas Giveaway! We have a winner for our $10 TravelFleas.com Gift Certificate Giveaway! Ian, AKA Bangkok_Ian, a Geocacher from Foxwood, England (A suburb of York, England) was the lucky winner. He is so named because he lived and worked in Bangkok, Thailand for 10 years. Sounds very interesting, perhaps we could convince him to be interviewed by this blog in the future. 🙂 Congratulations to him, and thanks to all who entered the contest. Didn’t win? You can always buy your own personalized TravelFleas from TravelFleas.com. They are very reasonably priced, and are a great signature item. Happy Black Friday, shoppers! Actually, we’re posting this Thanksgiving evening, but Thanksgiving is the new Black Friday. Our November/December 2013 TravelFleas Gift Certificate Holiday Giveaway went pretty well, so we’ve decided to make it an annual thing. 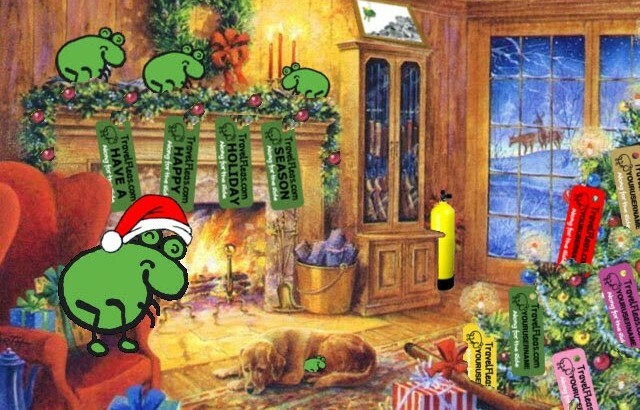 So once again, we’re giving away a $10 Gift Certificate to TravelFleas.com, and we want to insure that the winner has plenty of time to get theirs ordered, manufactured, and shipped before the holidays; as TravelFleas make a perfect stocking stuffer for that Geocacher in your life! The crew at TravelFleas are great friends of this blog and our website via social media. 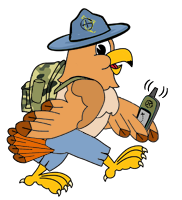 In case you’re not familiar with TravelFleas, they are personalized tags (they can accept up to 20 characters) measuring 1/2″ x 1 1/4″, which can be attached to a Geocaching trackable, or placed in a Geocache as a signature item. They are available in 12 colors, and you can buy them in the TravelFleas Store on their website. Note they have other items for sale, including TravelFleas logbooks, necklace kits, and license plates (a moot point for the blogger, who lives in a 2 plate State). Or you could learn more about them by reading the interview we did on this blog with John from TravelFleas on June 27th, 2013, or the interview The It’s not about the numbers blog did with Mike from TravelFleas in 2012. To enter The TravelFleas Gift Certificate Holiday Giveaway, fill out the form below with your name (as it says, “Geonick” is fine), and a valid email address. We will never use your email address, and the Google Document storing all the entries will be deleted after the contest. There are rules, of course, which appear below, in italicized text above the entry form. Don’t forget to check your spam folders, to see if you won! Rules: To enter, provide your name and email address in the form below. One entry per person, and one entry per email address. There are no Geographical restrictions, contest is open to anyone in the world. The contest begins upon publication of this blog post on Thursday, November 27th, 2014, and ends at 7:00 PM Eastern Standard Time on Wednesday, December 3rd, 2014. One winner will be chosen at random from the entries received. Winner will be notified via email, notification being sent from the email address opencachingnorthamerica at gmail.com (be sure to check your spam folders! ), and must respond within 48 hours, or the prize will be forfeited, and another winner will be chosen. Once accepted, the prize will be delivered directly from TravelFleas.com. Contest ended, entry form removed. Thanks to all who entered! 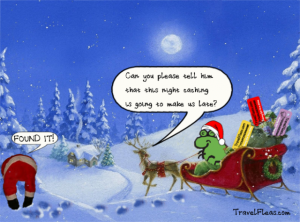 Winner announced for the TravelFleas Gift Certificate Holiday Giveaway! We have a winner for our $10 TravelFleas.com Gift Certificate Giveaway. Finally, that is. The rules state that the winner will be notified via email, and must respond within 48 hours. Not only did the first “winner” not respond, the second name drawn did not, either! People must be busy preparing for the holidays. Once the third name was chosen, the winner responded within ten minutes. Congratulations to that winner, Sherry (ShortFamilyTN) a cacher from Nolensville, Tennessee. Enjoy your TravelFleas, and thanks to all who entered. Better luck next time, and we believe there will be some more OpenCaching North America Pathtags given away in the near future. Stay tuned! True, it’s a little early for the holidays. 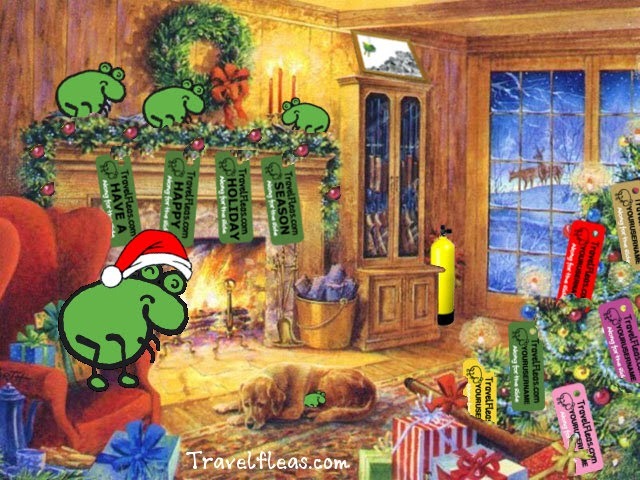 But we’re giving away a $10 Gift Certificate to TravelFleas.com, and we want to insure that the winner has plenty of time to get theirs ordered, manufactured, and shipped before the holidays; as TravelFleas make a perfect stocking stuffer for that Geocacher in your life! The crew at TravelFleas are great friends of this blog and our website via social media. In case you’re not familiar with TravelFleas, they are personalized tags (they can accept up to 20 characters) measuring 1/2″ x 1 1/4″, which can be attached to a Geocaching trackable, or placed in a Geocache as a signature item. They are available in 12 colors, and you can buy them in the TravelFleas Store on their website. Note they have other items for sale, including TravelFleas logbooks, necklace kits, and license plates (a moot point for the blogger, who lives in a 2 plate State). Or you could learn more about them by reading the interview we did on this blog with John from TravelFleas on June 27th, or the interview The It’s not about the numbers blog did with Mike from TravelFleas in 2012. Rules: To enter, provide your name and email address in the form below. One entry per person, and one entry per email address. There are no Geographical restrictions, contest is open to anyone in the world. The contest begins upon publication of this blog post on Monday, November 25th, 2013, and ends at 7:00 PM Eastern Standard Time on Sunday December 1st, 2013. One winner will be chosen at random from the entries received. Winner will be notified via email, notification being sent from the email address opencachingnorthamerica at gmail.com (be sure to check your spam folders! ), and must respond within 48 hours, or the prize will be forfeited, and another winner will be chosen. Once accepted, the prize will be delivered directly from TravelFleas.com. 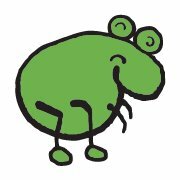 $10 Travelfleas.com Gift Certificate winner announced! Sorry, our graphic artist wasn’t available. 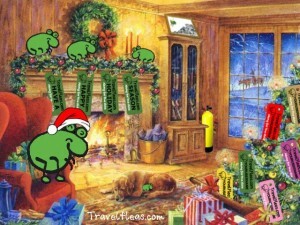 We have a winner in the $10 Travelfleas.com Gift Certificate contest!! Louis, AKA Nighthawk700, a Geocacher from Baltimore Maryland, was the lucky winner. His name was drawn last night, and he responded within an hour to claim the prize. We won’t disclose how many entries there were, but we hinted at it in the last blog post, and we can say dozens. The Google Doc storing the entries has been deleted as promised, along with all the entrants email addresses, which we would never use or share. Thanks to Travelfleas.com for providing the prize, thanks to all who entered, and congratulations once again to Nighthawk700. This was our first contest at the OCNA blog, hopefully the first of many, so stay tuned.